Aesar's Web is a den in South Western Rivenspire. A giant spider named Aesar the Hatespinner resides here. Kill the giant spider, Aesar the Hatespinner, at Aesar's Web. 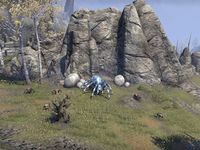 Hatespinner Hunter 5 Kill the giant spider, Aesar the Hatespinner, at Aesar's Web. This page was last modified on 19 November 2018, at 05:30.